Donald Trump has just completed the most closely scrutinized, subjectively reported, and widely criticized first year in the White House of any President in memory. Research indicates that the media have consistently provided Americans with an overwhelmingly negative assessment of his first-year efforts. Despite such lopsided evaluations by journalists, the American people have a less uniformly-negative view of the initial year of the Trump presidency. A national sample of 1,000 adults was asked 41 questions about Trump’s first twelve months in office. One of the most striking response patterns is how divergent the views of born again Christians are from those of other adults. Six out of ten born again adults who voted in the 2016 election backed Donald Trump. After his first year in office, the born again segment has remained generally supportive of President Trump. In 36 of the 38 questions on which respondents gave a positive/negative rating of some component of the president’s performance, born again adults held a more positive view of Mr. Trump than did adults who are not born again. On balance, most Americans have an unfavorable opinion of President Trump. In total, one-fifth have a “very favorable” opinion of him and another one-fifth (21%) have a “somewhat favorable” impression. On the other side of the ledger, one-eighth (13%) hold a “somewhat unfavorable” view of the nation’s chief executive, while three times as many (39%) say they have a “very unfavorable” opinion of President Trump. However, views differ radically by political ideology and by peoples’ personal faith. Among political conservatives, 71% have a favorable view, compared to half as many among moderates (36%), and about half as many again (19%) among liberals. The faith community’s views are also divided. A slight majority of born again adults (54%) held a favorable view of the president, while a minority of every other faith group had a positive opinion. Notional Christians (42% favorable), people aligned with a non-Christian faith (38%), and Skeptics (20%) were more likely to hold an unfavorable view of the president. The non-born again segment represents seven out of every ten adults in the U.S. Asked to assess his job performance, a majority of Americans disapprove of how the president is doing. In total, 45% approve of his performance while 55% disapprove. Conservatives, however, overwhelming applaud the job the president has done in year one of his term. Three-quarters of them (74%) indicated their approval of his work. That stood in stark contrast to the low levels of approval offered by moderates (41%) and liberals (21%). Six out of ten born again Christians (59%) awarded the president with positive approval ratings. That far surpassed the levels of approval given by notional Christians (46%), people associated with non-Christian faiths (46%), and Skeptics (23%). There were also substantially divergent views between Protestants (63% approval) and Catholics (44%). People who have a biblical worldview, known as Integrated Disciples, were far more likely than those without such a worldview to approve of President Trump job efforts (68% versus 42%, respectively). Another way of evaluating Mr. Trump’s performance was undertaken by asking what grade people would give the president for his first year in office. Using a standard A through F scale, one-third said they would give Mr. Trump an “A” or “B” (31%); 17% said he deserved a “C”; and the remaining half (49%) gave him either a “D” or an “F”. Nearly two-thirds of conservatives (62%) rated the president as having done an above average (i.e., “A” or “B”) job, while just 24% of moderates and 15% of liberals concurred. Close to half of the born again group (45%) awarded Mr. Trump an above average grade while only one-quarter of the non-born again population (26%) did so. That latter group was comprised of the notional Christians (31% offered an above average grade), people of non-Christian faiths (28% gave an above average grade), and Skeptics (13% provided an above average evaluation). Each survey respondent was asked to evaluate the president’s performance in 30 areas of leadership. The response pattern provides several general perspectives that are illuminating. There was not a single area of the 30 explored for which even four out of ten adults said the United States is doing better today than it was when Donald Trump was sworn in as President one year ago. By far, the two areas in which people were most likely to say the U.S. is doing better today than a year ago were the economy and national defense. While a minority claimed we are better off in these areas, they are the sole areas in which a larger share of respondents said we are now better off than said we are now worse off. The areas in which at least half of the nation believes we are worse off today than we were at the start of the Trump presidency were race relations (50% say we are worse off today) and national unity (54% say we are worse off today). Following the established pattern, conservatives were far more likely than moderates and liberals to consider America better off now than at the start of Trump’s tenure in most of the areas examined. Similarly, born again Christians were far more likely than other adults to view the U.S. as doing better under Trump’s leadership than we were doing prior to his inauguration. 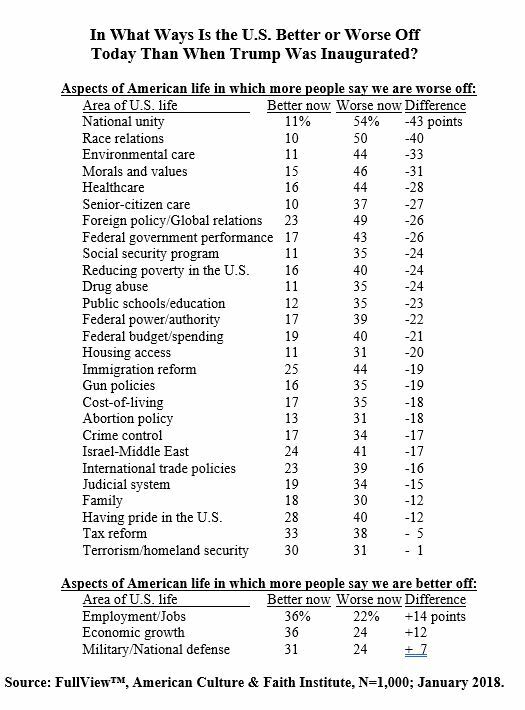 The dimensions of American life for which a majority of conservatives believe we are better off today than we were a year ago include employment and jobs (69% say we are better off, 12% say we are worse off); economic growth (66% better, 11% worse); tax reform (64% better, 19% worse); military and national defense (61% better, 12% worse); terrorism and homeland security (55% better, 16% worse); and having pride in the U.S. (51% better, 22% worse). There were two areas related to which at least half of born again adults said things are better today: economic growth (52% better, 16% worse) and employment and jobs (50% better, 16% worse). There were several areas of public policy and cultural conditions related to which substantially larger shares of the public believe the United States has lost ground during the Trump tenure than believe we have gained ground. When comparing the proportions of people who say things are better now than a year ago with those who say things are now worse than they were a year ago, the difference between those two points of view suggests that the “biggest losers” have been in the areas of national unity (43-percentage points more likely to say we are worse off); race relations (40-point difference); environmental care (33-point difference); morals and values (31-point difference); healthcare (28-point difference); senior-citizen care (27-point difference); federal government performance (26-point difference); and foreign policy and global relations (26-point difference). Donald Trump has faced criticism and pushback since Day One of his presidency. It is not surprising, then, that when survey respondents were asked to evaluate his performance in light of their expectations of him, the view is generally dismissive. Just one-quarter of adults (24%) suggested that Mr. Trump has done better than expected while one-third of adults (32%) stated that he has done worse than they expected. The plurality (39%) felt he had performed about as they had anticipated. The segments most prone to being pleasantly surprised by Mr. Trump’s first-year performance were conservatives (43% felt Trump had done better than they expected), Republicans (43%), Integrated Disciples (39%), born again Christians (33%), and SAGE Cons (51%). The segments most likely to say his performance was worse than expected included Democrats (51%), liberals (44%), non-whites (40%), Catholics (38%), Skeptics (37%), and adults who prefer socialism to capitalism (37%). Survey participants were asked to indicate what Mr. Trump’s most impressive achievement in office has been thus far. There was a wide range of answers provided, with the most common being that he has not accomplished anything impressive yet (mentioned by 29%). The accomplishment identified most often was the improvements to the economy (17%), followed by passage of the tax reform bill (9%), and the weakening of ISIS (5%). The existing ideological war in the country was evident in reactions to the president’s accomplishments. Conservatives were twice as likely as liberals to consider changes in the national economy to be a significant accomplishment (24% versus 12%, respectively); twice as likely to deem crippling the capacity of ISIS to be an impressive achievement (7% vs. 3%); and more likely to appreciate recognizing Jerusalem as Israel’s capitol (5% vs. 1%), facilitating tax reform (14% vs. 5%), and addressing religious persecution in the U.S. (3% versus 0%). In fact, 53% of liberals said Mr. Trump did not have any impressive achievements during year one; just 10% of conservatives agreed with that assessment. When respondents were asked to identify what they felt were President Trump’s strengths and weaknesses, the most common answer was that people did not know. Overall, one-quarter of the public (27%) was unable to identify any strength of his, and 17% failed to identify a weakness. The most frequently mentioned strengths were his self-confidence (11%), courage (8%), keeping his campaign promises (7%), and flexibility (6%). The most frequently mentioned weaknesses were his communication skills (12%), lack of humility (11%), inability to unite people (10%), limited intelligence (7%), lack of leadership ability (7%), and absence of compassion (6%). Four of out every five adults (82%) stated that they were aware of the on-going discussions about impeaching the president. Among those adults aware of the impeachment discussion, opinions were evenly divided regarding support for such a process: 42% favor impeachment, 40% oppose it, and the remaining 18% did not have a position on the possibility. While almost three-quarters of liberals support impeachment (72%), less than one-fifth of conservatives do so (18%). Just one-fourth of born again Christians favor impeachment proceedings (28%), compared to half of all non-born again adults (48%), six out of ten Skeptics (58%), and half of Catholics (47%). Despite all the negative opinions expressed about Mr. Trump’s first year in office, an imaginary election between the incumbent and an unnamed Democratic rival proved to be unexpectedly inconclusive. When asked how they would vote if the 2020 election for President were held today, with the assumption that President Trump received the Republican Party nomination to seek re-election, people were surprisingly indecisive about their likely vote. The outcome was a statistical toss-up between an unnamed Democratic Party candidate (34%) and Donald Trump (30%). The remaining one-third of potential voters said they would either not vote for president (11%), would support a candidate from another party (9%), or they simply were not sure what they would do (17%). The research described in this report is drawn from FullView™, a monthly nationwide survey with a randomly-selected sample of 1,000 adults, age 18 or older, whose demographic profile reflects that of the adult population. The online study on which this report is based was conducted by the American Culture & Faith Institute in the second week of January 2018. Born again Christians are about 30% of the adult population. They are people who consider themselves to be Christian and believe that when they die they will go to Heaven only because they have confessed their sins and accepted Jesus Christ as their Savior. Notional Christians are people who say they are Christian but do not meet the “born again” criteria. In other words, they do not believe that they will go to Heaven after they die solely due to having confessed their sins and asked Jesus Christ to be their savior. About 40% of U.S. adults are Notional Christians. Other Faith is a category that includes anyone who is aligned with a faith community that is not Christian in nature. These 9% of U.S. adults include those who are associated with faiths such as Buddhism, Judaism, Islam, Scientology, Hinduism, and the like. Skeptics are individuals who describe themselves as atheist or agnostic, or who indicate that they do not believe in the existence of God or have no faith-related ties or interests. This segment has grown to incorporate roughly 21% of all adults. SAGE Cons are a hybrid segment that combines faith and politics. The name stands for Spiritually Active Governance Engaged Conservative Christians. They are defined as adults who are registered to vote; they vote regularly; they consistently pay attention to news about government and politics; consider themselves to be Christian; are born again (see above definition); are deeply committed to pursuing their Christian faith; are conservative on social and economic issues; and are theologically conservative. They represent about 10% of the national adult population, representing approximately 20 million individuals. The American Culture & Faith Institute is a division of United in Purpose, a non-partisan, non-profit organization. The mission of United in Purpose is to educate, motivate and activate conservative Christians to engage in cultural transformation in ways that are consistent with the gospel of Jesus Christ. The organization does not support or promote individual political candidates or parties. Additional free information about this research is accessible on the American Culture & Faith Institute website, located at www.culturefaith.com. The full report, American Views on Patriotism, can be read or downloaded from the website. For access to many other studies conducted by ACFI, please visit the company website (www.culturefaith.com). To receive a free copy of the monthly research reports produced by ACFI, visit the website and register for the American Culture Review newsletter.